A dry, but windy day at Cleeve led to some frustrated players, but also some close results for the gross team championship. It was an excellent test of the golfing skills of the players and talk of at least a 2 club wind was heard as discussion of their games echoes around the clubhouse. A couple of sheep were involved in collisions with golf balls necessitating extra shots to be taken by players and lost balls were found in rabbit holes as spotters walked in afterwards. So a few high scores on the odd hole,but also a few birdies achieved. A nail biting finish as the ladies waited to see whether the last 2 teams would alter the winners, so there was a great cheer from Cotswold Edge when the last score was entered and they found they had retained their lead but with a reduced margin of one. 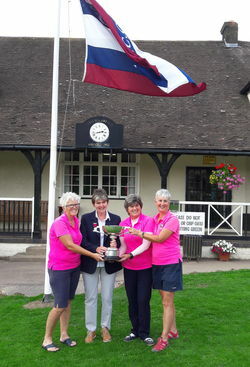 Corrine Durber expressed her delight and surprise as she received the trophy from Sue Rawles, Sue thanked Cotswold Edge for their fantastic support of the County, there is always "plenty of pink" at every competition! Sue went on to thank everyone at Cleeve for their excellent hospitality - it's a small club with a big heart!